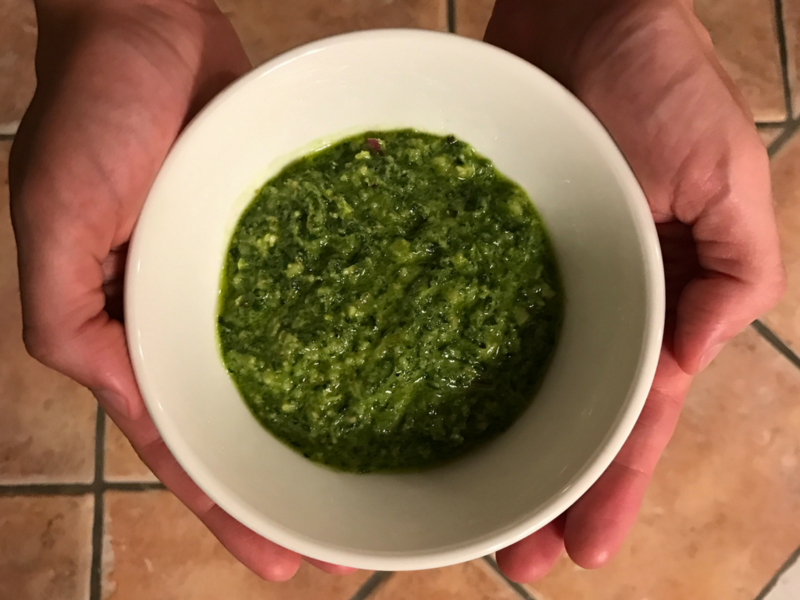 This recipe sort of came together like how all my recipes do: I was really in the mood for pesto but I was too lazy to go to the market. Luckily, my fridge and pantry were stocked with all my FAVORITE ingredients so this recipe was considered a no-fail from the beginning but trust me, it’s even BETTER than you’d think it would be because it has an extra richness that you don’t expect. The spicy and peppery arugula has that extra POW of flavor that makes a little of this pesto go a long way. The roasted garlic oil takes out that extra bite that a lot of people don’t like with raw garlic. Fresh lemon juice really makes this pesto sing. Buttery, roasted cashews gives the pesto so much extra body. Finally the cheese seriously takes this dish from simply delicious to totally over the top. TRUST ME. Make this for dinner to throw at the last second over some warm pasta and extra parm grated on top. Use some as a spread for a DELISH panini for lunch the next day. Throw some on top of some freshly scrambled eggs. Mix it into your hollandaise sauce. I can probably just take a bath in this stuff. Throw all the ingredients (minus the garlic oil) into a blender. Start the blender on low, extra slowly drizzle the garlic oil into the blender as the machine is going. Stop halfway in between to push down the sides with a spatula. Once the pesto is the consistency that you’d like, don’t add anymore olive oil. Try serving this on a bed of warm pasta, mix in some pasta water to combine it with the pasta and sprinkle on lots of freshly grated parmesan. Spread this on two sides of thick sandwich bread. Top one side with four tomato slices and top the other side with four thick slices of fresh mozzarella cheese. Close the sandwich and spread a thin layer of mayo on each of the outer sides of the sandwich. Grill for the most amazing grilled cheese of all time. Brush this (diluted with more garlic oil) on top of shrimp kabobs, while on the bbq for an instant umami flavor bomb. Dilute this with more lemon juice and olive oil and whisk together for an incredibly flavorful salad dressing. Mix this with equal parts mayo for an insane sandwich spread. The possibilities are endless!